George Eliot, The Poetry. Poetry is a fascinating use of language. With almost a million words at its command it is not surprising that these Isles have produced some of the most beautiful, moving and descriptive verse through the centuries. In this series we look at individual poets who have shaped and influenced their craft and cement their place in our heritage. 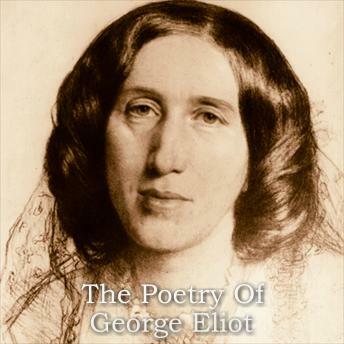 In this volume we look at the works of the Victorian Authoress and Poet George Eliot. Mary Anne Evans was born in 1819. Her Father did not consider her a great beauty and thought her chances of marriage were slim. He therefore invested in her education and by the time she was 16 she had boarded at several schools acquiring a good education. With the death of her mother in 1835 she returned home to keep house for her father and siblings. By 1850 she had moved to London to work at the Westminster Review where she published many articles and essays. The following year Mary Anne or Marian, as she liked to be called, had met George Henry Lewes, and in 1854 they moved in together; a somewhat scandalous situation as he was already married albeit with complications. Her view on literature had taken some time to coalescence but with the publication of parts of Scenes From A Clerical Life in 1858 she knew she wanted to be a novelist and as her 1856 titled essay "Silly Novels by Lady Novelists" stated not a 'silly woman's one at that. Under the pseudonym of George Eliot that we know so well Adam Bede followed in 1859 followed by the other great novels of English literature Mill On The Floss, Silas Marner and Middlemarch. Success of course meant that her real name came out but it seemed not to affect how the public devoured her novels. Here, we look with a keen eye at her poetry. Although slim in number she is able to take a situation, scene or thought and bring us into its world with undeniable care.